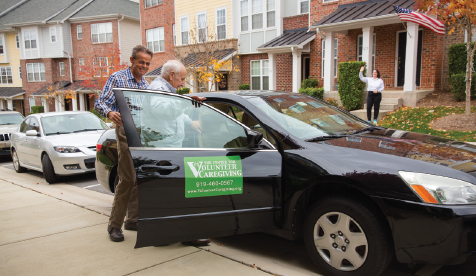 Activate Good is encouraging the public to volunteer at area nonprofits such as the Cary-based Center for Volunteer Caregiving. The folks at Activate Good, a nonprofit that matches volunteers with dozens of Triangle-area causes, invite you to give back to your community on Tuesday, Sept. 11. The annual “9/11 Day of Service” was conceived as a way to honor those who lost their lives 17 years ago. This year, more than 80 projects will take place throughout the day. Projects benefiting the following organizations are among the many local opportunities for service: Inter-Faith Food Shuttle, Habitat for Humanity, Marbles Kids Museum, Ronald McDonald House of Durham, and more. Those who are interested can also donate blood over their lunch break for the Red Cross. To volunteer, folks are invited to sign up for one or more projects online at activategood.org/911day2018. An evening commemoration, including live music, speakers and refreshments at Raleigh’s Red Hat Amphitheater, will conclude the 9/11 Day of Service. People who are unable to attend a daytime project or would like to continue their service can participate in one of the hands-on, family-friendly service project stations that will be set up at the amphitheater starting at 6 p.m. The event is free, although attendees are asked to bring a non-perishable food item to donate to Urban Ministries of Wake County. Sponsors for the Triangle day of service include Wells Fargo and Genworth Mortgage Insurance. To register to volunteer for a project during the 9/11 Day of Service, visit activategood.org/911day2018. Groups and companies are also invited to volunteer as a team. Contact Activate Good at volunteer@activategood.org for details. Read the June Nonprofit Spotlight to find out more about Activate Good and its mission to inspire people to volunteer in the community.